Abhishek Sinha, a Blair senior and the editor of Silver International, was oneof three English language learners who spoke to educators at a conference sponsored by U.S. Deparment of Education's Office of English language Acquisition on November 1, 2006. Last Wednesday two other English language learners and I were selected to speak at a conference organized by the U.S. Department of Education’s Office of English Language Acquisition to speak on behalf of ESOL students. With me were Maritza Martinez-Garcia, a senior at J.E.B. Stuart High School in Fairfax, VA, and Karla Rivera, a senior at Bell Multicultural High School in Washington, DC. The conference was for the heads of the state ESOL programs and others who work with English language learners in the U.S. 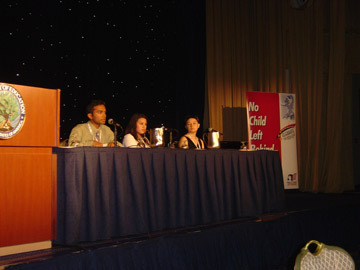 The conference was actually trying to help schools understand the importance of closing the gap for the ESOL students. The conference, which was called “The Rising Stars Summit V,” started on October 30th and ended on November 1. On the final day of the Summit about eight hundred people from all around the country met for their final luncheon in the ballroom of the Washington Hilton Hotel. As part of that luncheon, the other students and I all were given chance to speak about our experiences in the ESOL program in our schools, and to let them know about the difficulties we face, reasons for our success, and give recommendations to the people at the luncheon. Karla said strongly that it’s her personal motivation which helped her to be a successful student. “In my case it’s me and my willingness,” Karla said. She said that learning English was difficult at first, but she read children’s books and watched cartoons on TV to help learn vocabulary. When asked what we wanted the people to take back with them one thing I said was that teachers beyond the ESOL department should be well informed about what to expect from an ESOL student because some teachers don’t understand ESOL students. After the students spoke at the coference, each received an achievement award from Katherine Leos, an Assistant Deputy Secretary and the Dirertor of the Office of English language Acquisition (OELA). 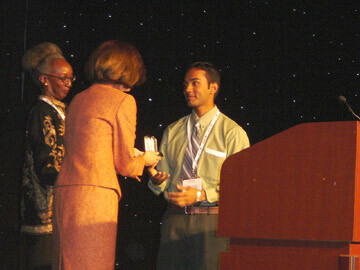 Here Abhishek Sinha receives his award. Also pictured is petraine Johnson, an Education Program Specialist in the OLEA. One of the things that I wanted to communicate to the people is ESOL students need opportunities to prove themselves to the community which they are rarely given. They are also capable of doing things like any other regular students, but they are not always given a chance. For all of us it was a terrific opportunity to be a part of this Summit and to have a chance to express our thoughts and feelings about ESOL students. For me personally it was just an amazing experience that I’ll never forget. I don’t know if our testimony will bring changes for ESOL students, but at least we were given a chance to speak directly to so many important people who work with ESOL students.